Homework Hotline is opening a new satellite office in Shelby County Schools staffed by SCS teachers. This new partnership also created a new Hotline number for Memphis students. 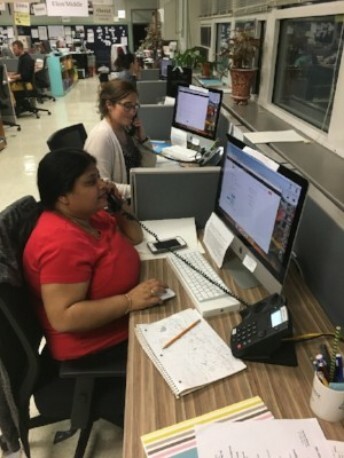 Hotline remains dedicated to working with all K-12 students in Tennessee, but by hiring SCS teachers, Hotline is bringing in teachers who are very familiar with different curriculum taught in different parts of Tennessee, specifically in Shelby County. Hotline’s mission remains the same: to provide free tutoring to K-12 students in Tennessee over the phone or online chat. The new Shelby County teachers will join the Nashville teachers on the other end of the phone lines, just in a different location. Opened in 1990, Hotline has hosted over 530,000 tutoring sessions. Since August 2018, Hotline has held over 7,300 sessions with over 3,000 unique students and parents. With teachers who can speak Arabic, Spanish, Farsi, Hindi, and Swahili, students and parents/guardians who speak a language other than English can also find assistance. 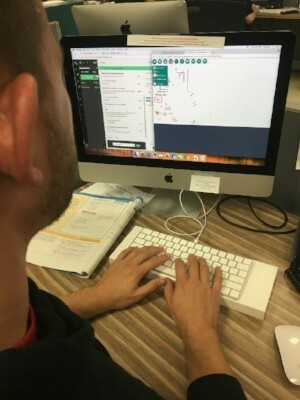 Technology like online chat, text-an-image, online whiteboards, and Google Docs, Hotline bridges the gap of not being in the same place as the student calling. In fact, many students value the ability to “call for help” from where they are, whether it’s in their living room, at a relatives house, or even from school or the library. Hotline is excited to be welcomed into a partnership with Shelby County Schools, and knows that this partnership will provide even more students with free tutoring after school. The new phone number is 901-416-1234. Questions can be directed to ask@homeworkhotline.info. Thank you to Lacy at the Southern Standard for writing about Homework Hotline! We were excited to meet her at the Warren County Board of Education meeting, and to be featured in the McMinnville, TN circulation! (Note: we wish we had Titans tickets to give away, but we do have some cool Titans keychains! Also: please initiate a session with us before texting images or emailing your Google Doc. Meet our partner ... The Community Foundation of Middle Tennessee! 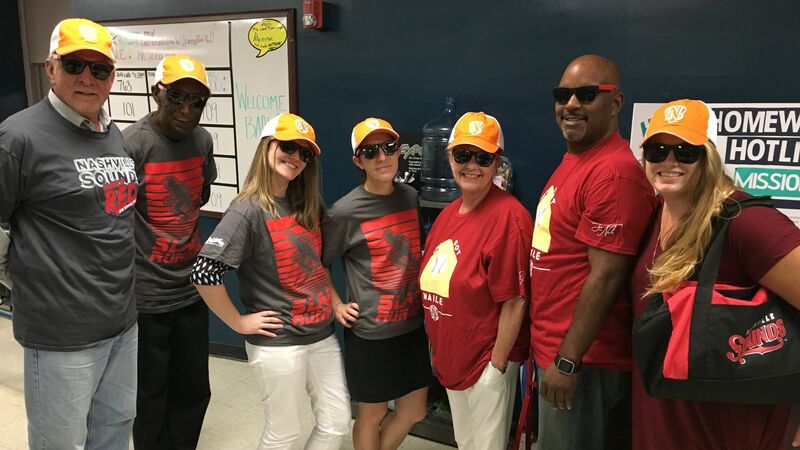 Have you heard that Homework Hotline has received a generous grant from The Community Foundation of Middle Tennessee? These funds will be used to support our programs, and will directly help us to continue to offer FREE tutoring to all K-12 students in Tennessee, especially students whose home language is not English. We have tutors who speak Arabic, Farsi, Hindi, Spanish, and Swahili, in addition to English. The Community Foundation awarded more than $2.72 million in grants to 453 nonprofit organizations as part of the 2018 annual grantmaking process. The Community Foundation awards discretionary grants annually from its unrestricted and field-of-interest funds through an open application process to Middle Tennessee nonprofit organizations addressing community needs and benefiting the well-being of citizens through valuable programs and innovative services. The Foundation connects generosity with need in order to build a stronger community for the future. To learn more, please visit www.CFMT.org. Homework Hotline would not be able to continue without the generous support of organizations like The Community Foundation. We have some exciting news as we reach the end of the school year! Homework Hotline has provided almost 6,000 sessions to K-12 students in Tennessee during the first semester of the 2018-19 school year! Our last day for this semester is December 12, 2018! We'll be open from 4pm-8pm to help you prepare for your end of semester exams and homework assignments. We'll reopen on January 7, 2019, at 4pm! Click here or see the text box below on how to take our user survey! 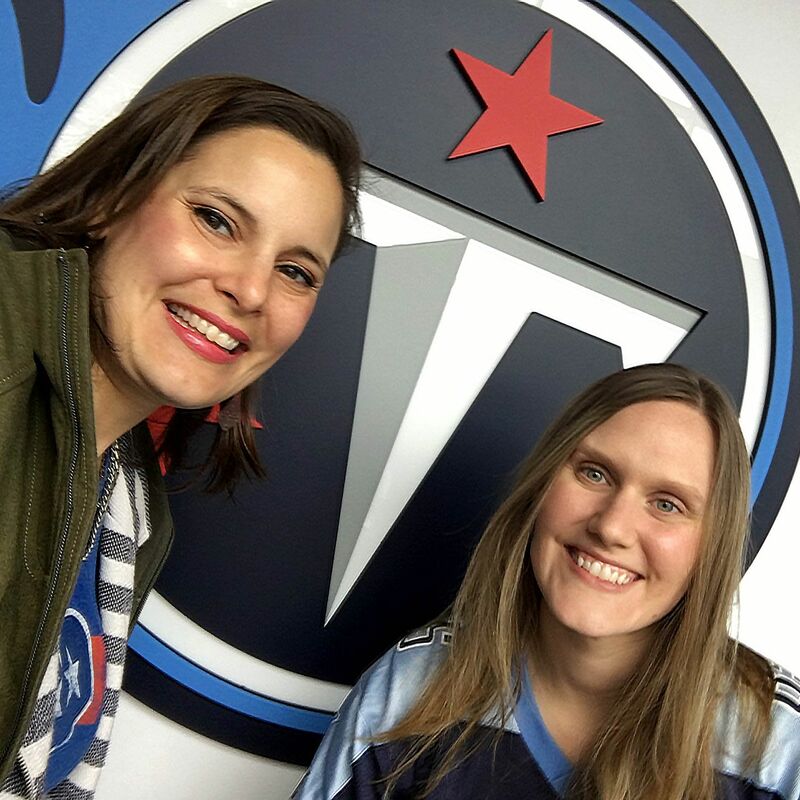 Help us raise money by cheering on the Tennessee Titans! 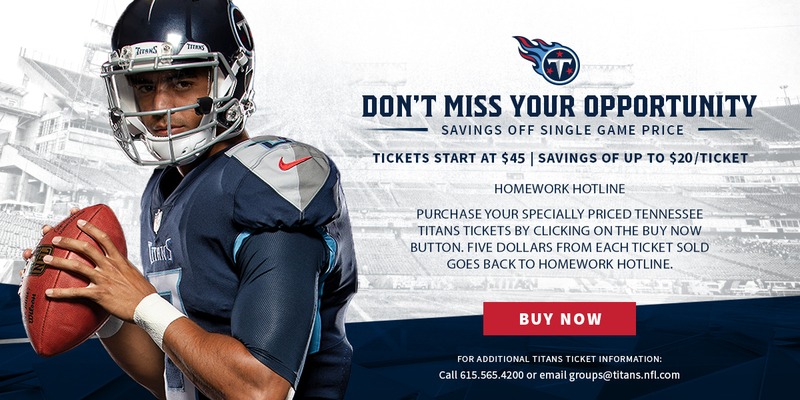 They have set up a link for $45 tickets to the Titans vs Redskins game on December 22 at 3:30pm: The perfect holiday weekend outing while supporting Homework Hotline! When you use this link: https://www.fevo.com/edp/Titans-vs-Redskins-uyiKA65 $5 of every ticket will be donated to Homework Hotline (and it's a discounted price from the ticket price)! We are available for you at ask@homeworkhotline.info if you have any comments or questions. Thank you for helping us assess, improve, and support our services! We at Homework Hotline wish you a safe and happy holiday season! Have you called Homework Hotline this school year? We've extended our user survey through Friday, December 14 at midnight! If you've called or chatted with Homework Hotline this school year, please help us and fill it out! This satisfaction survey, being hosted and evaluated by an independent research consultancy, will help Homework Hotline better understand who is using our service and how it benefits them. Click the button below, or copy and paste the following text in your browser: https://www.surveymonkey.co.uk/r/HomeworkHotline2018. NASHVILLE, Tenn. – (December 2017) The Community Foundation of Middle Tennessee, a charitable organization dedicated to enriching the quality of life in the 40 Middle Tennessee counties it serves, announces more than $2 million in grants to 346 nonprofit organizations as part of the 2017 annual discretionary grant making process. Homework Hotline has received a $10,000 grant to provide 2,000 free one-on-one literacy and math tutoring sessions to 750 students and parents from 45 partnering TN counties. The Community Foundation awards discretionary grants annually from its unrestricted and field-of-interest funds through an open application process to Middle Tennessee nonprofits organizations addressing community needs and benefiting the well-being of citizens through valuable programs and innovative services. More information on the grant process is online at www.cfmt.org. Since 1990, Homework Hotline has provided over 520,000 sessions of free one-on-one tutoring with certified teachers and trained volunteers to TN students and parents so that students can return to school more confident and less discouraged. Homework Hotline’s mission continues to be to help Tennessee students in grades K-12 learn, understand and complete challenging assignments, and master new concepts through free one-on-one tutoring by phone and online chat.